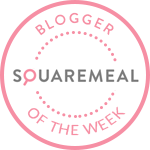 Huge thanks to Square Meal who have voted me their event blogger of the week! What an honour and what a lovely notification to receive out of the blue! I will display the badge with pride! Many #eventprofs will already be familiar with Square Meal – the UKs leading guide to restaurants, bars, venues and events. They produce a useful annual guide on venues which is well worth grabbing a copy. Square Meal attend some of the major UK exhibitions where you can easily meet them and pick up your copy or simply register via their website so you don’t miss out. More information can be found at via: http://www.squaremeal.co.uk/. I will watch with interest which other event bloggers will receive the title in the future and hopefully discover some new favourite UK event blogs and bloggers.